Starting Friday, it will be illegal for almost all drivers on Illinois roads to text while driving. The new law amends the Illinois Motor Vehicle Code to ban not only texting, but also any "electronic message" such as instant messages, e-mailing, or accessing an internet site while driving. The bill bans the use of any electronic device including cell phones, PDAs, and laptops. It does NOT ban the use of GPS systems. The ban covers Text Messages (TMs) as well as any other "electronic message" such as an email or a post on a social networking site. There is an exception for reporting "emergency situations", for any device that allows for "hands free" messaging, and for commercial drivers that have permanently installed communication devices on their trucks/cars. The law provides some exceptions for police officers and truckers who rely on electronic information, but for the bulk of drivers in Illinois, if you are caught "texting while driving" you will face a ticket. Text messaging and other forms of distracted driving have been shown in study after study to greatly increase the risk of traffic accidents. This new law is a real world example of the legislature appropriately addressing new technological issues in the interest of protecting the health, safety and welfare of its citizens. 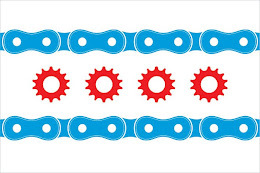 This law was passed in the aftermath of the death of Illinois cyclist, Matt Wilhelm. In September of 2006, 25 year old Matt Wilhelm was riding his bike on the shoulder of a downstate road. Matt was known as a conscientious and safety minded rider. He rode to the side of the road and always wore his helmet. But what Matt was unable to plan for was a teenage driver who swerved off of the roadway onto the shoulder and struck Matt on his bike. The teenage driver, by some accounts, blamed her actions on the fact that she was text messaging while driving and became distracted.This is a horrific story and an unfortunate one that illustrates the real dangers of text messaging while driving.